Four New Albany Middle School cheerleaders participated in Disney World's Thanksgiving Day Parade, representing Varsit;y Spirit. 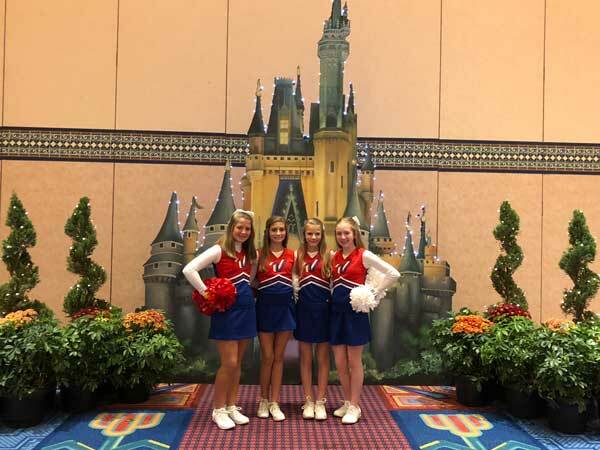 Logan Lee Robertson, Addi Owen, Sarah Robbins, and Caroline Renfrow from New Albany Middle School in New Albany, Mississippi joined more than 800 elementary, junior high and high school cheerleaders and dancers from across the country that represented Varsity Spirit in the 2018 Thanksgiving Tour at the Walt Disney World Resort in Orlando, Florida. (L-R) Sarah Robbins, Addi Owen, Logan Lee Robertson, Caroline Renfrow, all NAMS cheerleaders, at Disney World Thanksgiving Day Parade 2018. The individuals invited to perform in the parade were part of a select group of cheerleaders and dancers chosen as All-Americans during Varsity Spirit summer camps across the country. All-Americans are selected via try out based on either superior cheerleading or dance skills at camps operated by Universal Cheerleaders Association (UCA), Universal Dance Association (UDA), National Cheerleaders Association (NCA), or National Dance Alliance (NDA). Only the top 10% of the cheerleaders from Varsity Spirit camps earn the chance to march in a holiday parade of this caliber. Logan Lee, Addi, Sarah, and Caroline performed with the Varsity Spirit All-Americans in an one-of-a-kind pre-parade performance through Disney’s Magic Kingdom Park on Thanksgiving Day. Besides enjoying a sunny trip to Orlando, All-Americans had the opportunity to meet cheerleaders and dancers from across the nation and enjoy a magical holiday season at Walt Disney World Resort parks.